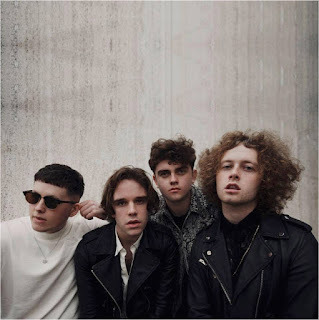 Clay are one of the most exciting young bands around, growing their following with each release and without attaching themselves to any scene or trend that's going. They're about to play their biggest dates yet following the release of their latest single Saint including a headline set at Gorilla in Manchester this Saturday. We caught up with front man Joe for a chat. For people who don't know you, could you introduce Clay and tell us a little bit about how you got together. We came together as we were all disillusioned with the path that people expected people like us to take. We felt an inherent need to make music and didn't really feel anyone was making the music we wanted to listen to. We're the biggest Clay fans in the world! You recently released your first single of the year Saint. Could you explain a bit about what the song's about? Lyrically, the song is a response to '6AM', our previous single, so it kinda offers alternative perspective to that story. We like to think of the tracks as a sort of text message conversation. What inspires you to write and do songs come from one of you or do you write as a band? This may perhaps sound arrogant but when we're really deep into the writing process we only listen to our own music. I'll listen to previous tracks and think 'what would be a natural progression after this track?'. The key for us really is that progression though, and it's important that we keep evolving. Song ideas tend to start with Jack or Joe, and then it grows into something bigger. Each single you've released has seen your audience grow. And you've just signed to Lab Records. How did it feel signing on the dotted line? Yeah I do feel the releases are very literal markers of our growth as a band. For us, it was just important that we worked alongside like minded people as we're incredibly meticulous about every aspect of the band. So LAB has given us that creative freedom which has been amazing. Are you looking to record and release an album in the near future? Naturally, we're always working towards an album, but we don't have plans to record one just yet. We've collectively agreed that we don't want to record and release and album until we're sure it'll go to number one. We don't want to be a band who releases something irrelevant at the wrong time and then disappears. You're playing Gorilla in Manchester this Saturday which is an impressive statement for a band from out of town without an album or major label behind them. Do you think there's a bond between you and the crowds here? For sure, the fans have been the one constant since the band began and we truly appreciate them. 'Saint' was the first time we'd played a single live on the road before we released it. The fans absolutely loved it and we were inundated with people asking us to release it, so we did. That track is our ode to the fans I guess. It's definitely a bond. When you started off the band, did you imagine you'd be headlining shows of that size? Yeah. We have never been a band who get too comfortable. We want to be the biggest band in the world. When we turn up to these cities and see sold out rooms of people singing our songs it tells us we're doing something right. This is just the beginning though. We're incredibly ambitious and won't stop til we reach the top. When we saw you in Edinburgh last summer, it felt the tour was being done on a very DIY basis (parents selling merch) but you stayed and talked to everyone afterwards and signed everything. Do you think that's important and what's the most devoted fan tale you've heard doing this? I think it's very important to communicate with the fans. Without them we wouldn't exist so we are eternally indebted to them and it's always something we will do. We've had people travel from Germany and Holland to see us! That's pretty devoted I guess! A couple of weeks after that we met you at the Night and Day with Tom from Blossoms who'd come to watch. Does what they've achieved make you think there's room for young guitar bands to make their mark again now? Definitely, we're all big fans of Blossoms and what they have achieved is incredible. We've never really considered ourselves a 'guitar band' though in all honesty. I think as long as the songs are progressive and exciting and the lyrics really connect with people, you will ultimately be successful. Have you got festivals lined up for the summer and anything you're particularly looking forward to then and in the rest of the year? Our focus really has just been on the May shows but we intend to be on the full festival circuit next year. We do have some very exciting stuff that we can't say just yet, though. One last question, how would you describe Clay to someone who's never heard you before? The greatest band you've never heard. They play Cardiff Club Ifor Bach (May 18), Manchester Gorilla on Saturday (20) and London Thousand Island (June 8).